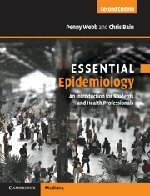 A clear and practical introduction to epidemiology for all students and health professionals interested in health data. Using recent and classical examples, it covers both infectious and non-infectious diseases, giving students an understanding of the fundamental principles of epidemiology and its role in all areas of health monitoring and research. Penny Webb is a Senior Research Fellow and Head, Gynaecological Cancers Group, Queensland Institute of Medical Research, Brisbane, Australia.